I got him about 4 months old. He was born outside and wasn't friendly at all. Lived under my couch for the first 2 months or so. We couldn't touch him or really even look at him without him hissing. BUT with lots of love and work he has become the king of our home. Giving us lots of loving. I couldn't ask for a better friend. After a year and a half, they are the biggest loves any pet owner could ask for. They are just wonderful. The best! I am so glad that these two kitties have made your life fun. 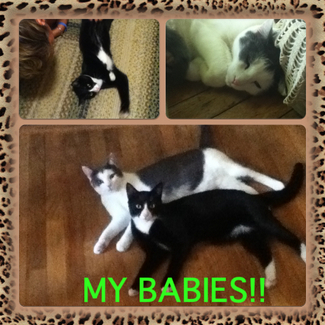 Wasn't sure at first but they sure do have a loving home, and as you say your very Best Friends. Enjoy them. They are absolutely beautiful. I can't believe such a striking beauty could be homeless and unloved. By the way, I'm also a Kim, and Mr. Spitzie looks a lot like my Minnie Pearl that I rescued from the pound a few months ago. I hope to have her picture and story up soon. Thanks for sharing. I love both pictures of your kitties. They're so handsome. 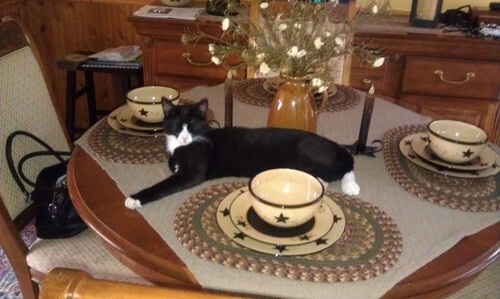 Mr Spitzie looks so comfy in that beautifully-set table. And both he and Spatters look so great together. Getting help from site, hopefully be up soon. Great name! I'm guessing it came from the spitting and hissing in the beginning? It's so heartwarming to hear stories where someone was wise enough and kind enough to be patient and teach a sweet, homeless kitty the wonders of a loving family and the comfort of a secure, forever home. I'd love to see pics.